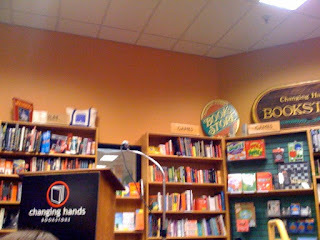 I did end up at Changing Hands Bookstore last night for Kaleb Nation's book signing (promoting his new/first book Bran Hambric: The Farfield Curse.) There's one benefit of living in a city: I can actually go to events like this. I'm still trying to figure out whether I like that more than looking outside and seeing more than buildings and pavement and cultivated grass and more buildings. I'm a little ashamed to say that I'd never been to Changing Hands. It's such a famous place, and I've certainly been close by many times. I took a look around before the signing; they have a great selection. I'll make it a point to go back. I asked him to date it because it is his first tour, that date will mean something in a few years. It's epic. Last bit of info: the letters for the sequel are TSK. I'm thinking "The Secret . . ." Maybe "Kingdom?" That just sounds like Atlantis, though. There's also "King" and "Second" . . . how about "The Second Kurse?" It could be an intentional typo . . . I had to leave quickly to finish writing a paper, study for a Latin quiz. Speaking of which, I have half an hour until that quiz, so I'd better glance at my notes again before I need to rush off. 1. Here Burns My Candle by Liz Curtis Higgs. The release date for this one has been pushed back once or twice, but it's set to come out in the spring. Liz is one of the few modern writers that I really love; she can turn out such an emotionally dense story. 2. The Twilight Saga Official Guide by Stephenie Meyer. It was originally supposed to come out December 31st, 2008 . . . last I checked, Barnes & Noble was listing the same day in '10. We'll see it that's true. 3. The New Moon Official Illustrated Movie Companion. I've already pre-ordered it, but even though I'll get it in about two weeks, I'm waiting until I see the movie to open it. Insane, I know. But I have to stay away from spoilers and pre-ordering is just too tempting. 4. I think I can now add the next Bran Hambric book by Kaleb Nation. I don't think I'll be holding my breath too much for it, yet it'll be nice to have. 1. You guessed it, New Moon. Sixty more days. I'm tempted to go to the midnight showing, but that probably won't be happening. I'll probably see it at a dull time around 2:30, giving me time to go to class, get lunch, and be at the theatre with ample time. 2. The Voyage of the Dawn Treader. The first two Narnia movies, well, they had their good and bad points. I still love Narnia itself enough that I'll continue watching, anyway. Plus, I think this next one is going to be different from the other two. I'm really starting to think having Michael Apted directing and David Arnold with the music, not to mention the two way-too-old oldest Pevensies mostly out of the picture, will make it better. 12/10/10. 1. Josh Groban is working on his next CD right now, which will probably come out in the spring. I'm really curious what tone he's going for. Three studio albums (minus the Christmas ones) are still beginnings. A fourth starts to show who you are as an artist overall. 2. Fireflight is also recording their next album. I've been really into them lately. They have great lyrics that make their approach to a loud, hard genre unique. No idea when the release is. 3. After years of just touring, Flyleaf is back. Even when I found them a year ago, their album was already old, so I'm really looking forward to hearing their next one. The single "Again" seems to set a good standard. October 27th. 4. It's just over a week now until the 29th, when Paramore's Brand New Eyes comes out. I wasn't overly impressed by "Ignorance" the first time I heard it, but it's grown on me. One week until I can hear the rest. 5. And let me just add in the rest of them. Hayley (Westenra), aren't you due for another album soon? Emma (Shapplin), will you ever get a third studio album? I would really like one. Oh, and Blondfire, didn't you say you wanted to release at least an EP this year? But I know it's hard for them since they're using their own label; Emma also had trouble with record companies. Alright, I think I've hit most of them. I guess it isn't that long a list, if you really think about it. A slight makeover for the page. I'm still not sure if I like the background. It might have too much going on, but I'm really not techie enough to design my own, so I'll try it out for a bit. And I think I may look mad in my profile picture . 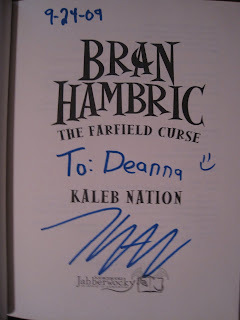 . .
Alright, here is the book I was reading last week: Bran Hambric: The Farfield Curse by Kaleb Nation. I was only a few chapters in on my last post, but guess what attached itself to my hands all weekend long, allowing me to finish on Sunday night? First, a little background. I started reading Kaleb's site, twilightguy.com, around March. It's a blog that recorded his thoughts on reading the Twilight books, chapter by chapter. What I loved about the posts was the unique perspective Kaleb had, with random humor and keep perceptiveness. So I started to get . . . curious about his book. Finally, I gave in and preordered it about a week in advance (it was just released on September 9th.) I still wasn't expecting to be particularly drawn in; I just wanted to support Kaleb and maybe find some of his humor in the book. Especially since I'd read the first four chapters online already, I didn't expect any more. But Bran Hambric is about as unique as twilightguy.com. It's a teen read, dealing with magic and mysterious pasts, yet it's its own world. I think people are often tempted to create a fantasy (or halfway fantasy, like this one) setting based off of the ones they already know. While there are elements that we all love to keep, this can hinder originality. Kaleb Nation's originality isn't hindered. Neither the setting nor all the turns of the story are predictable. I especially like that when we learn about the main character Bran's past, we don't learn that he is some great, mythical figure destined to set all the world to right. We learn that he has a vast potential for evil, if he chooses. But by Bran not choosing to follow that, we get into some great themes about choice and identity. There are still a few rougher corners, I think, given that it's a first novel, though in such a way that it can be passed over. I prefer to look at the good things. We have some parallelism in the plot (Bran's choices and Rosie's), some intriguing imagery, and yes, great humor. In fact, that's what makes this book worth reading: it's fun. You can purchase it at these links: Amazon, Barnes & Noble, and Borders. The book signing tour will be in Tempe next week; I think I'll just have to go. This fancy word for "busy" makes you sound much more organized. "Busy" sounds like you're overrun, with papers and calendars flying around, hardly enough time to brush your hair in the morning, and overall pretty sloppy. "Assiduous," on the other hand, makes you out to be devoted. You have so many things to do because you're caring enough to take them all on, then complete them all. Only problem is, you'll sound a little funny saying calling yourself "quite assiduous lately" in casual conversation. It's true, though, that they're not exact synonyms. Busy is just defining the amount of work you have to do, while assiduous explains how you approach your work. Me, I'd like to say I'm being assiduous. If I don't get done with the day's work until late, I still read a chapter or two in the book I'm reading right now (title to be disclosed once I finish it -- hopefully in the next week.) That means I've been getting to bed past eleven . . . hurray for Saturdays to sleep in. But in my present assiduousness I must be going now. Two weeks into my time at ASU, I think I can safely spend a few minutes on a post without thinking I should be spending my precious leisure time more leisurely. So, we come once more to The Chronicles of Narnia. As I went through The Silver Chair, I started likening Eustace and Jill's search for Prince Rilian to Percival's search for the grail. True, there are a lot of stories about searches and I've only read a little bit of Percival's story, but there's a similarity in the tone as well as the content. Percival and Jill/Eustace fail to see the obvious: Percival doesn't realize he's found the grail and the other two don't realize they've reached one of the signs (the "Under Me.") Their quests are also faith-based. This is obvious on Percival's part, but Jill and Eustace have to go off of a very small bit of info, then put their trust in Aslan to do the rest.